When I last wrote about the schedule of Republican presidential nominating contests back in April, there were two dynamics that appeared to be shaping the calendar: first, the usual “frontloading” temptation of states to run to the front of the line in order to have an impact on the results, which both national parties have been fighting in recent years with less than brilliant success; and second, a more unusual “backloading” phenomenon, where other states were delaying primaries or caucuses for their own reasons, often the money savings associated with holding the contests in conjunction with regular nominating events for down-ballot offices. Since then, it looks like both phenomena have only intensified, with numerous implications for the GOP field. And because the two trends pull in opposite directions, they indicate that the Republican nominating contest will likely play out in one of two remarkably divergent ways: either as a quick victory or as an extended slugfest. In an interesting joint effort, both national parties have sought in this election cycle to bring order to the calendar by maintaining the privilege of four early states—Iowa, Nevada, New Hampshire, and South Carolina—while pushing them to hold their contests no earlier than February. Other states, meanwhile, are being ordered to hold back until at least March or, barring that, suffer penalties (for Republicans, this means the loss of half of a “rogue” state’s delegates). As was the case in 2008, Florida is first on the list of potential scofflaw states; its primary is currently scheduled for January 31, 2012, which, if it stays that way, could influence the First Four states to move their contests up to the beginning of the year or even December of 2011. But in contrast with 2008, where Michigan was Florida’s only partner is defying the calendar, four other states—Arizona, Colorado, Georgia, and Missouri—have positioned themselves to follow the Sunshine State into unsanctioned early contests, with Arizona and Georgia bestowing a single official (Arizona’s Governor Jan Brewer and Georgia’s Secretary of State Brian Kemp) the power to set the exact date. At the same time, “backloading” pressures are likely to lead several especially large states—e.g. California, New York, and Texas—into later contests. As an added incentive to budgetary concerns, the national GOP has decreed that only those states holding contests after April 1 will have the option of awarding delegates on a winner-take-all basis, traditionally the main difference between Republican and Democratic primary rules. The end result, as recently explained by election calendar guru Josh Putnam to The New York Times’ Jeff Zeleny, is the destruction of that hardy perennial of state calendar machinations, Super Tuesday, which will shrink from 24 states participating during the last cycle to only about 10 in next year’s contest. If both these trends play out, it could significantly increase the probability of either a quick victory or an extended slugfest, much like the Democratic contest of 2008. In that fight, Barack Obama came within a few thousand votes in New Hampshire of putting Hillary Clinton’s campaign on life support on January 8, but ultimately had to wait nearly six months (until June 4, to be exact) to claim the nomination. As for which outcome will come to pass, the conventional wisdom this cycle is that an early knockout is unlikely. At the moment, if you were to take bets among the handicappers of pre-election speculation, the favorite in Iowa is Michele Bachmann; in Nevada and New Hampshire, it’s Mitt Romney; and in South Carolina, it’s probably Rick Perry (if he runs, and it’s looking increasingly like he will). But all three of these candidates are also theoretically capable of an early run of the table. Bachmann, for her part, has been moving up on Romney in New Hampshire polls, and has an ideological profile well-suited for South Carolina. And if Perry competes in Iowa and splits the social conservative vote with Bachmann (and Tim Pawlenty and Herman Cain, if they are still around), Romney will be tempted to contest Iowa—where he continues to do well in the polls—and with his strength in Nevada and New Hampshire, could pull off a trifecta of victories in the first three contests. Finally, Perry’s one-two punch of appeal to social and economic conservatives could make him quickly competitive everywhere, as his recent double-digit standing in national and some state polls even prior to an announcement indicates. Add in the wild card of several other contests immediately after South Carolina—particularly a Georgia/Florida combo—and one candidate could put the whole thing away pretty quickly. 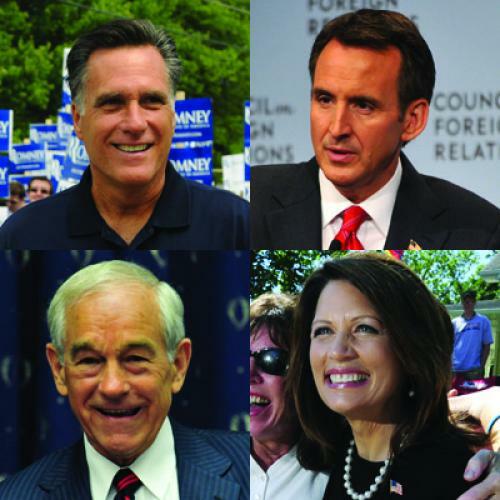 Romney could play well in Florida, while both Perry and Bachmann might have an advantage in deep-red southern states and in low-turnout Caucus states like Colorado. The “clustering” of early primaries where candidates can get fresh bursts of momentum without the massive effort associated with a Super Tuesday-type national event could be crucial in 2012. If that doesn’t happen, though, the backloading of the calendar after the early flurry portends an extended campaign where the same three candidates have an opportunity to stay alive. Yes, deep-pocketed candidates like Romney and Perry would have superior resources for this kind of extended national campaign (though Bachmann, unlike her 2008 counterpart, Mike Huckabee, is no slouch at fundraising, either). But the decimation of Super Tuesday means that no one will be in the position Obama enjoyed in 2008 of using superior resources to sweep a host of delegate-rich caucuses held on a single day—arguably the crucial factor in his eventual nomination. A candidate like Bachmann, meanwhile, who enjoys iconic status among both Tea Party and Christian Right activists, could, if the money is there, register strong second- or third-place finishes in a lot of states. After April 1, however, that strategy won’t serve her as well if some of those states will be choosing to award their entire delegate hauls to the winner. The bottom line is that the emerging calendar could produce an early nominee, or could even lead to that rarest of phenomena: a multi-candidate contest that stretches into the late spring. It does not appear to advantage or disadvantage any one candidate, but instead presents a complex strategic challenge to the entire field. In the end, the winning campaign may not be the richest, or even the luckiest, but the smartest.